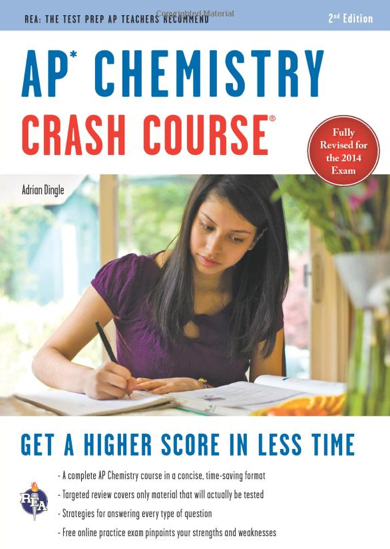 Support for AP Chemistry Crash Course, 2nd Ed. Unfortunately, tiny errors, typos, and the need for tweaks & amendments are all an inevitable part of publishing hard-copy books. Virtually all attempts to reduce them to zero, fail. No matter how many eyes pass over the text, it is extremely unusual for a book to go without the need for modifications in future printings or editions. The AP Chemistry Crash Course is no exception. There’s also a unique problem with this particular book. It was originally written prior to May of 2014, i.e., prior to the new exam actually coming into being. This means that when the 2014, 2015, 2016 and 2017 exams actually hit, they brought with them a clearer focus on certain topics. When considering all of the above, it is going to be necessary to make tiny changes to the book over time in order for the product to improve. You may think this happens via a new edition and that the 3rd Edition will be coming out soon. However, that’s not quite how it works! A entirely new edition of the book is unlikely to be produced before there is some major change in the AP exam. Given that we have just had one such huge overhaul, a new edition of the book is unlikely anytime soon. However, what does happen is that popular books get re-printed as the current supply runs out. What we can do, is to make changes between re-prints, and slowly, over time, the books that have those improvements make it into the supply chain. As such, when you read some of the changes that I list below, you may already be in possession of a hard-copy book that has incorporated them. On the other hand, you may not – it just depends on what stage the publisher has reached in terms of dealing with the tweaks, and which re-print you happen to have in your possession. Either way, this page should prove to be a useful companion to the book. Below I will list some of my thoughts (and those pointed out by others), that will hopefully move the original printing of the 2nd Edition of AP Chemistry Crash Course book, ever-increasingly toward ‘perfection’! Please don’t hesitate to contact me if you find something that requires a tweak and I will happily consider it’s inclusion here (and in future re-prints). There’s a small, but significant typo on p 19. (Thanks to Daryl Westfield for the spot). I will tweak the simulated PES plot for sodium. The simulated PES plot in the book is ‘correct’, but at the time of writing the College Board had NOT released any definitive, example material (subsequently they did release information, but this was 6 months after the new course had started in most schools, and close to a year after my deadline to finish the book). As a result, we were all guessing as to how PES spectra would ultimately be presented (no sample material was available) and the #1 source of information on the web at the time was the Arizona State University resource that had (as still does have), the axis ascending and tiered. Since the first printing of the book, we have now learned that it is most likely that the x-axis will be reversed, with the scale descending (rather than ascending), from left to right, to allow the order of the electronic configuration (1s2 2s2 2p6 3s1) to be read from left to right as shown below. The original (first) printing of the 2nd Edition shows the x-axis scale ascending. “third” should read, “second” in Q2. In 6ii. The sentence should end, “bottom to top.” (Thanks to John Christians for suggesting these amendments). The wording in relation to molecular solids and I2 could be a little clearer. When I say is ‘held together only with London dispersion forces’, I am referring specifically to solid iodine. You should understand that other molecular solids e.g., ice, can have intermolecular attractions that are not just LDF’s, in the case of ice, hydrogen bonding being present as well.